Basil Italian Large Leaf Ocimum Basilicum is a very popular, versatile herb that is grown from basil seeds. 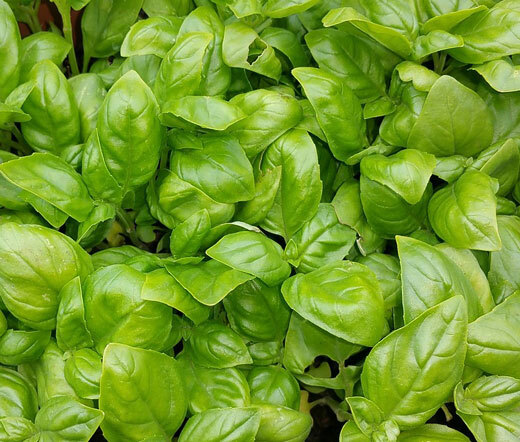 Italian Basil grows 24 inches tall, and this prolific plant features very large, oval, medium to dark-green basil leaves producing very aromatic, white flowers in summer. The fragrant blooms are popular with bees and butterflies. Basil Italian Large Leaf is an eye-catching bushy plant that is suitable for garden beds, containers, and pots. The growing Italian Basil looks great in a warm, south window, and this herb can be grown indoors in winter. Ocimum Basilicum seeds are one of the easiest to germinate, and the established Basil prefers well-drained soil, even moisture, and full sun. Italian Basil is wonderfully fragrant growing in the garden as well as spicy in your cooking. This Basil has a particularly strong fragrance and flavor making it excellent for almost any basil dish, particularly pesto. Both fresh and dried Basil leaves are used in seasoning meat, poultry, fish, many Italian tomato and pasta dishes.